One of the best retail parks in Bristol in a gateway location off junction 2 of the M32, adjacent to IKEA and Tesco. Bristol is the largest commercial centre in the South West of England. Located in a highly prominent and accessible location about 3 miles north east of the city centre, adjacent to Junction 2 of the M32, which links the City with the M4 and M5 to the north. IKEA generates 4.2million visitors a year. 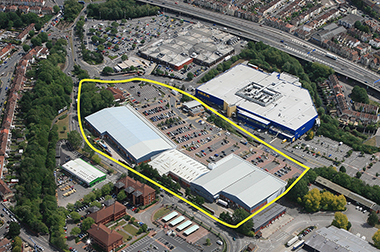 A terrace of eight retail warehouse units and two stand-alone restaurants totalling 114,084 sq. ft. and including 550 customer car parking spaces. Eastgate has the benefit of an open A1 planning permission subject to some restrictions. Access and pedestrian improvements to the wider Eastgate retail area. Refurbishment of the Pets and Home and Halfords units.